The Sand Point Lighthouse served mariners continuously from 1868 until 1939, except for a short time in 1886 when it was out of commission because of a fire which severely damaged the building. This also cost the life of Mary Terry, one of the first women light keepers on the Great Lakes. Nine keepers and their families lived in the Sand Point Lighthouse and kept the light burning in its tower and shining out over Little Bay De Noc. 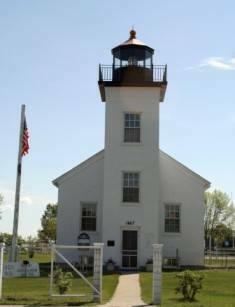 When the US Coast Guard took over all navigational lights in the country from the National Lighthouse Service in 1939, changes came to the Sand Point Lighthouse.